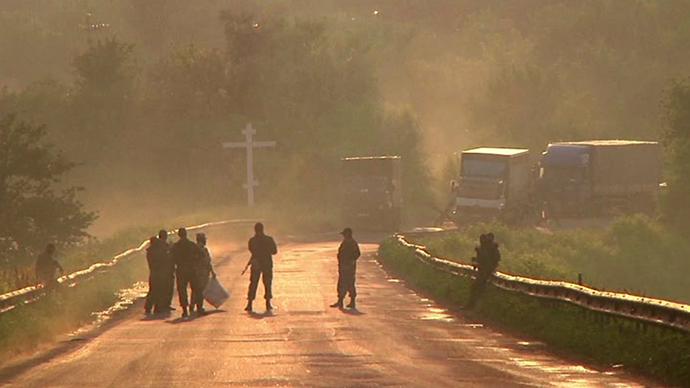 Lugansk militiamen on a road waiting for Ukrainian troops. In an unprecedented move, Ukrainian self-defense forces and Kiev’s troops have carried out an exchange of dead bodies near Donetsk. However, a fragile ceasefire reached for the exchange was interrupted by shooting. 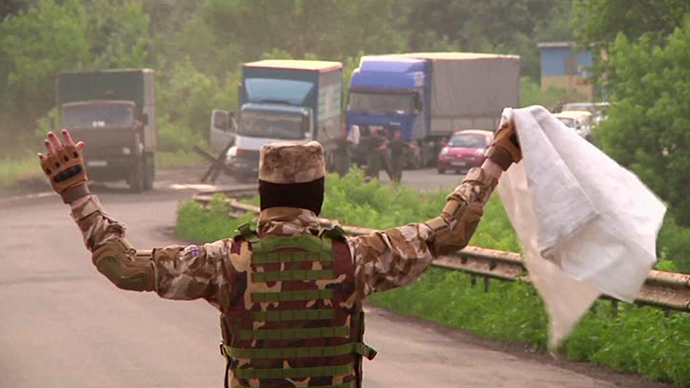 Waving a white cloth, self-defense forces of the Lugansk People’s Republic, wearing camouflage and masks, met Ukrainian troops on a road. The latter were also hold a white flag with a black ribbon over it. 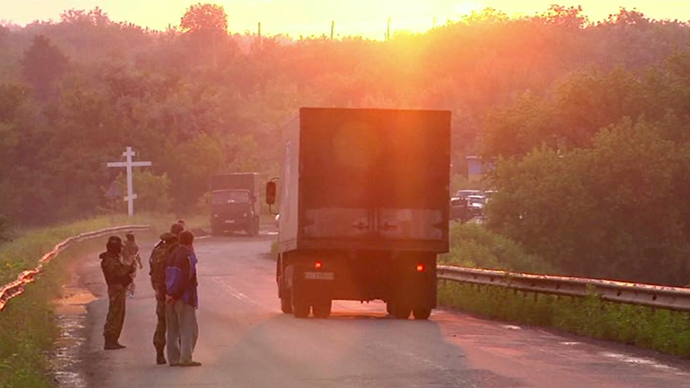 The dramatic exchange took place at dawn in the eastern town of Karlivka, just outside Donetsk. The Lugansk militiamen took the bodies of nine of their killed comrades and also 12 injured troops and handed the remains of over 100 of Kiev’s army fighters to the Ukrainian forces, "not counting those in the airport." The two sides managed to arrange a brief truce to hand over the bodies of Ukrainian troops, including those who died when the anti-Kiev troops shot down a transport plane over last weekend. As a member of the anti-Kiev troops, who identified himself as Sova, says in the video, one of the trucks “holds 49 bodies of Ukrainian paratroopers who died near Lugansk airport. We didn't receive anything in return in this handover," he told AP. As the white trucks crossed de-facto borders, both sides returned to their respective positions. The fragile truce was a temporary measure with no timing set. According to media reports, shooting broke out even before the exchange at dawn was complete. “We have fully complied with the terms of the agreement, letting them pick up their dead," Lugansk People’s Republic representative Valery Bolotov said, adding that "it happened in Donetsk region and at our southern borders." After the handover, Bolotov claimed that Ukrainian armed forces “demanded $5,000 for each body.” The Ukrainian self-defense forces want to collect bodies from another region – near the town of Shchastye – but that is impossible so far, said Oleg Tarasyuk, a representative of the Lugansk People’s Republic. 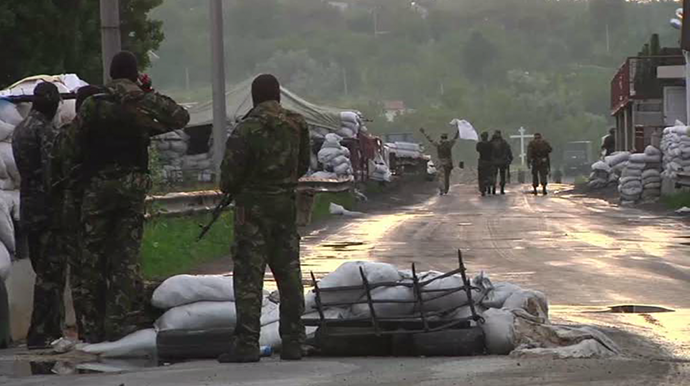 The two sides are also holding negotiations to exchange prisoners, Bolotov said.